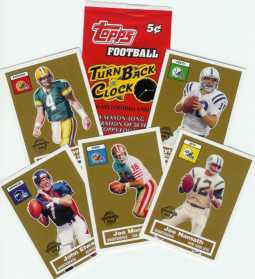 Topps is pleased to announce that September 10th & 11th, NFL's Kick-Off Weekend, has been designated Topps "Turn Back the Clock" Weekend. On September 10th and 11th, football fans and collectors can walk into their local hobby shop and purchase a special pack of Topps 50th Anniversary Football cards for just a NICKEL! That's the same price for a pack of football cards in 1956. The 5¢ pack will include the first 5 cards of a 22-card set with each card styled after the 1956 Topps design. Each and every week following "Turn Back the Clock" weekend, that same hobby shop will have one brand new 50th Anniversary football card from the special 22-card set. And the only way to get the card is if you purchase a pack of any 2005 Topps Football product. To find a participating store nearest you, dial 1-888-GO-TOPPS or log onto www.topps.com and use the Home Team Advantage (HTA) store locator. Founded in 1938 as Topps Chewing Gum, Topps issued its first professional football cards in 1956 and is an international marketer of entertainment products, principally candy, collectible trading cards and sticker album collections. Topps Internet business includes Topps.com, eTopps.com, TheToppsVault.com and thePit.com.